Muriel was motivated to become involved with the Patient Forum after caring for her daughter, Ruth, who lived with multiple sclerosis, for 17 years before she sadly passed away. “I wanted to give something back as I had so much experience of being in and out of the hospital with Ruth and so I knew first-hand what that felt like from Ruth’s perspective as a patient and mine as her carer. We appreciated the many things the hospital did well but could also see some improvements which could easily have been made to make our experience and that of other patients and their families better. “Myself and the other members of the Patient Forum are interested in improving the hospital for everyone in the community. The Patient Forum is a chance for us to speak face to face with the General Manager, Seán Murphy and the Director of Nursing, Dr Anne Drake and tell them what the hospital is doing well but also where changes need to be made to improve the service. We do not discuss the personal issues of any individual patient or family but rather we look at the wider picture. We keep our ears to the ground and bring feedback both good and bad directly to hospital management. Being involved in the Patient Forum has given us an insight into the running of the hospital and all that it entails. “The Patient Forum is made up of volunteers and staff representatives from the hospital and we meet four times a year for around an hour at a time. Over the years I have been involved in many important initiatives, for example, we compiled a patient information booklet provided to all patients on admission which is available in English, Irish and Polish and is available online. I have also provided communication training to Non Consultant Hospital Doctors so they could understand how it feels to be the patient in the bed. “Most recently we recommended that a notice listing the different Departments on each floor of the hospital be placed inside each lift. We had feedback from visitors and patients coming to the hospital that they hop into a lift but then are unsure of which floor to get out at. This is something that wouldn’t occur to staff working there who know the hospital inside out and is an example of a very simple suggestion to address a problem from a patient’s viewpoint that makes a big difference. The Patient Forum at Letterkenny University Hospital is now actively seeking to recruit new members. If you are interested in finding out more, please contact the Consumer Services Department on 074 9123503 or e-mail consumer.services@hse.ie. 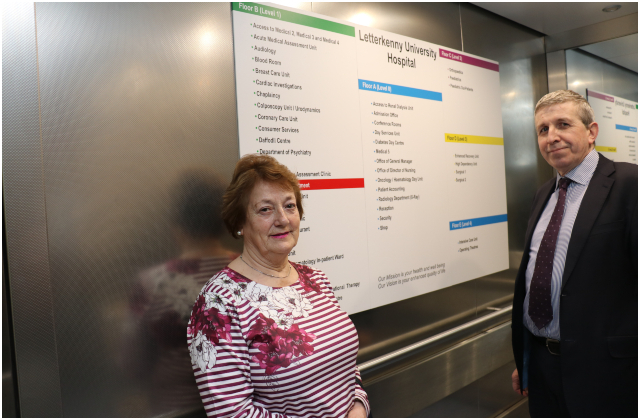 Muriel Perry Chairperson of the Patient Forum at Letterkenny University Hospital with Seán Murphy, General Manager.